I spent a lot of my art time sketching out things I want to paint as well as painting abstracts. I am just now getting in the groove of being back to work and being a mom, finally finding the time to paint which I am excited about. I did create some forest critters for my sons nursery which were a lot of fun to paint. Another big project for me last year was wrapping up my Bachelor's Degree in Graphic Design. Now that I have that under my belt, I am looking to take on more graphic design work. This year I am hoping to line up some new art shows and am really excited to get started on a ton of new art! 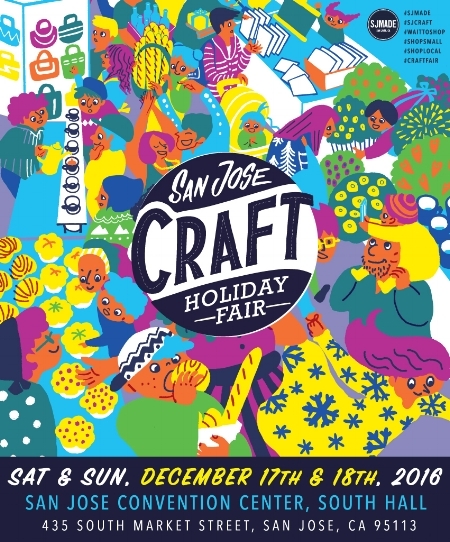 I am super excited to be participating in this year's upcoming SJ MADE Holiday Craft Fair! Now that my husband and I are settled in San Jose, I am more than ready to get into the SJ art scene and excited to start painting and making some fun new stuff! I'm having a sale in my Etsy Shop! Take 25% off of ANY order of $25 or more using the code SUMMER16 (even sale items)! Visit Heavens to Betzy on Etsy HERE! New Website + Upcoming Show! It is with great excitement that I am launching my revamped website! It will still be a work in progress, but is quite a bit of an upgrade from the former! There are some exciting things in the works for the rest of the year for Heavens To Betzy, starting with an Art show later this month! I will, of course, have some new work to show as well some old favorites! I will also have some giveaways for anyone who buys a ticket to the show! What a wildly busy and exciting few months it has been for me! Planning a wedding (even a small and somewhat informal one) really takes up a lot of time and energy - to the point that my only real art projects over the past few months were for the wedding. BUT! I wouldn't change any of it because it truly was the best day ever and has filled me with so much inspiration. I feel like the luckiest girl in the world to be able to call Scott my husband. He is an amazing partner, always supporting me in my art endeavors. He goes to every show, helps me set up, lets me bounce concepts and ideas off of him and always encourages me, acting as the biggest fan of my art. But the love and support does not stop there. He is my absolute best friend and the man of my dreams! Upcoming Art Fair and new things in the works! Well, it's that time of year again! I will be participating in this year's Art Fair at the Public Health Institute in Oakland and I'm really excited about the new pieces I will have available!! I've said it before but, often times, life gets in the way and my painting takes a back seat so I love when I have an event coming up because it gives me the push to create. Since I know that art is not for everyone (as in not everyone likes to actually own originals or purchase them which it totally understandable), I like to make my art available in other forms that make it more accessible for everyone. I thought it was time for some new t-shirt and necklace designs! I am super excited to have them available at the art fair on December 11th! I think this Art Fair will be a nice close out to 2015 and I already feel like it will give me the momentum I need to go into 2016 refreshed and ready to paint (it's going to be quite a busy and exciting year for me)! It's been a slow summer for my art. I have not painted nearly enough. In July, Scott and I took vacation and came back engaged! So that has taken up most of my time. But painting is always on my mind. With an abundance of ideas but not necessarily enough time, I have found myself starting quite a few paintings but finishing only a few. Most of this year I have found myself in a rather experimental phase as well - leaning more towards abstract work. But, I feel that this is a necessary phase. One to teach me to grow as an artist an challenge me. Here is a glimpse of the work I've been creating (or those I have managed to finish). The Heavens to Betzy website will be undergoing some changes over the next couple of months. It's time for some updates! April was an exciting month for me... I had the opportunity to show my work at a local bottle shop called The Good Hop in Oakland. With limited time before I hung my work, I hustled to paint some new girls (ones I had thought of long ago but never gotten around to painting). 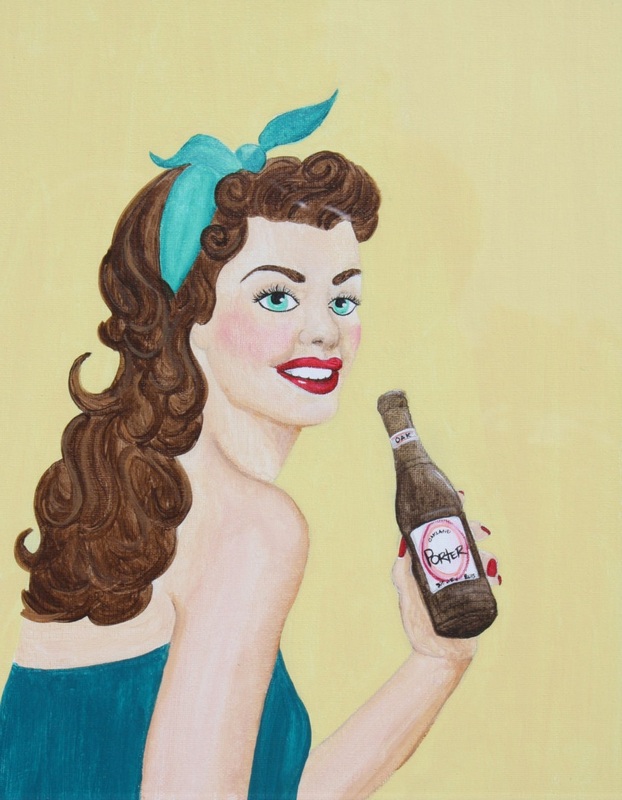 My newest girls are inspired by ads from the 1950's as well as one of my favorite hobbies, craft beer. They have that slightly changed feel to them and reflect the direction my art has been taking. April came and went so quickly and I definitely loved having my work up at The Good Hop. My art studio is on it's way to landing me on an episode of Hoarders, so I'm having a sale to clear some space! I want to be a full time artist, badly. But patience is most certainly a virtue... along with a stellar worth ethic and drive. I am fully aware that there is a chance I will never make a living as an artist. I will certainly not make financially what I make as an Administrative Coordinator... Some days that depresses me and other days it motivates me. I want to paint more, blog more about art, market my work more, etc etc.... All of which takes a great deal of time and effort. So some days, it feels like I have a second full time job in art and it can be (at times) dauntingly exhausting. Art is hard to sell. I'm not creating pieces that are for everyone nor am I out to make a ton of money or appeal to the masses. I do it for me. I only wish I could do it every day all day because it's all I think about. I am interested in making a living off of it so that I can be the happiest version of myself. Art is a passion I cannot shake no matter how hard I try. As a creative, I can be incredibly critical of myself. In all honesty, there are a lot of days where I want to give up. It takes time and money and you have to be incredibly resourceful and motivated to make it work. But there are days that humble me beyond words and make me extremely grateful. Selling original paintings does not happen often, but when it does.... well words cannot describe the feeling. 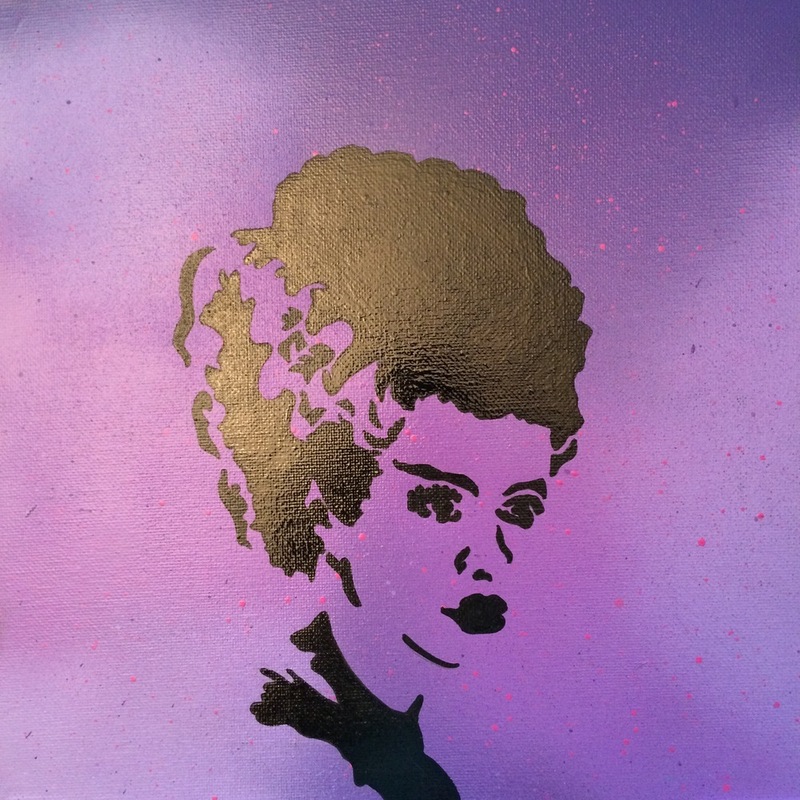 For someone to connect with a painting and make the decision to spend money they earned on something I created - well, that is just incredible. This morning I shipped this painting off to her new home in New York! This painting is quite near and dear to me. I must admit that some paintings are just created based on little intrigues, completely void of a deeper meaning, while others are a complete window into my soul. The title of this painting, "Bringing my sinking ship back to the shore," is a lyric from a song that hit me like a ton of bricks during a time of hardship. This painting is a product of that and one that I am proud of. So today, I said farewell to a beloved piece and did so with a full heart and hope that the new owner is more than pleased upon receiving it. 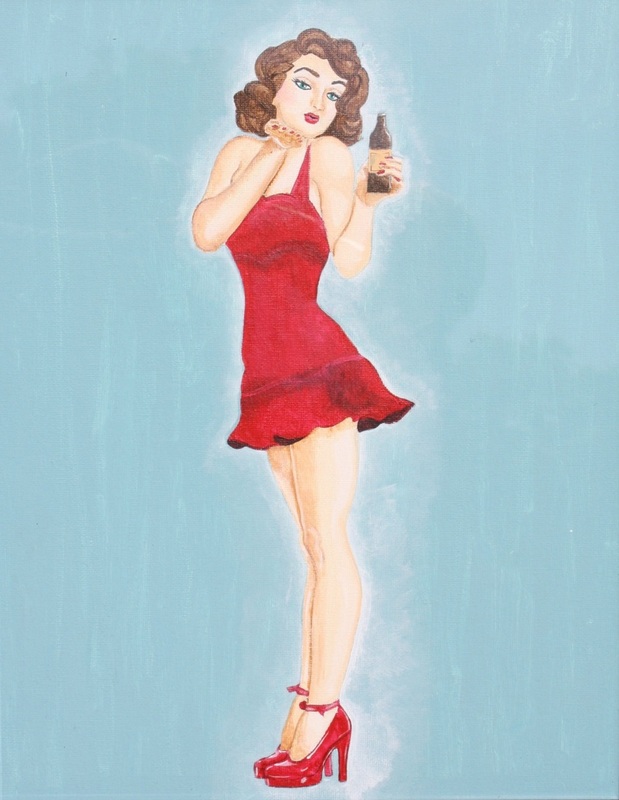 Dames & Dolls - My first Solo Art Show! What a way to start the new year! I have my very first solo art show this month! The last few months of 2014 were pretty awesome for me art wise and I could not be more excited to keep that momentum going into 2015. I have some other exciting things in the works as well... but for now, this is my focus! I will be painting as much as time will permit until the shows opening. This is an important event for me so I would absolutely love it if all of my friends and family could make it out to the opening reception on Saturday January 17th! GlamaRama is a super awesome Salon in Oakland and I think my art is going to fit perfectly there! It's that time of year again! I will again be participating in the Arts & Crafts Fair at my work, The Public Health Institute! 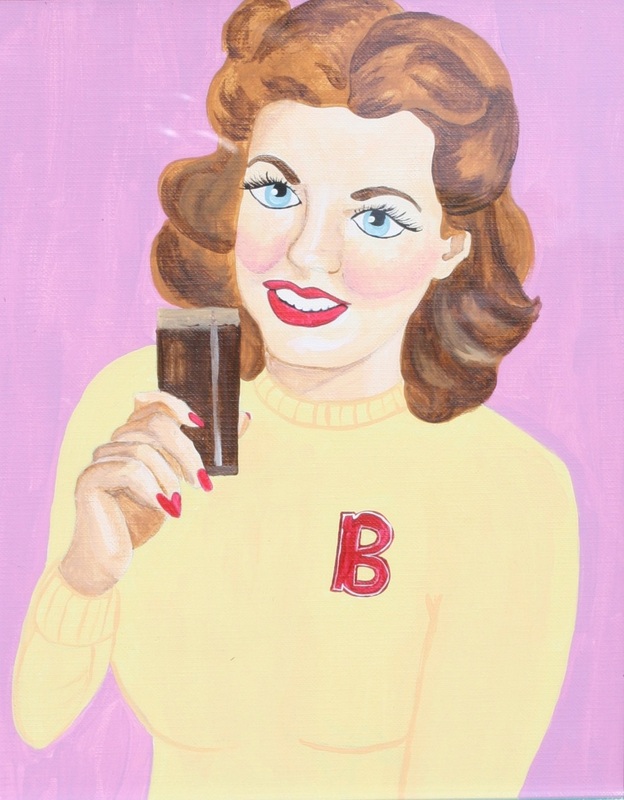 A portion of my sales will be donated to the East Bay Agency for Children! SFEtsy Indie Holiday Emporium - The creative push I needed! Sometimes, you just need a little creative push or something to set your soul on fire in the best possible way. For me, that is an art event. Life gets in the way sometimes or plain and simply gets you down, creating moderate to severe creative fatigue. I have been experiencing such fatigue lately and definitely needed a push! And I got a big one! I am SUPER excited to be a vendor at this year's SFEtsy Holiday Emporium! Now that I have re-sparked some creativity, I have a lot to accomplish over the next few weeks, including a ton of painting, crafting an eye-catching display booth and finding a place to produce solid yet inexpensive prints! I have already begun making some new necklaces and just last week designed and sent off for printing 3 new t-shirt designs. I am also really excited about the other vendors and the potential to do some holiday shopping that weekend! So, I hope to be posting very exciting sneak peeks, assuming life doesn't become all-consuming and get in the way along the road. It has been just about a week since the RAW SF showcase, Communique! The photo above is of me in front of my display. This was my 4th time participating in a RAW showcase and I could not be more grateful to have found such an amazing resource for Artists early into a career. RAW:natural born artists is an independent arts organization, for artists, by artists. I don't think I could describe the organization as a whole and do them enough justice so if you are an artist across pretty much any medium, (including painting, illustration, fashion, music, photography, etc., etc. ), within the first ten years of your art career, you should definitely check out RAW's website and learn more about what they offer (free with the small stipulation that each artist is responsible for selling 20 tickets). The very first time I showcased any of my art was in October of 2012 at a RAW showcase. The shows are much more than art on display, covering such a wide range that just about anyone could attend a show and have a good time. It is by far one of the best places for artists to network and they provide photographs and video interviews, which can be utilized long after the showcase passes. If I sound like I work for RAW and am giving a shameless plug, I apologize. I only wish I worked for RAW. It has sincerely been one of the most useful tools since the start of my art career and as a worldwide organization, I think more up and coming artists should take advantage of such an awesome resource. So as I decompress after an extremely busy couple of months, I find myself reflecting on the most recent show I participated in and I can't help but feel extremely grateful to RAW and hopeful of things to come! For the past 3+ years I have worked as an Administrative Coordinator for a non-profit organization on a Federal Grant. Now this was originally intended to be a 5 year grant, but like many things in life, that was not a guarantee. I had a 5 year plan. A plan to save up money and build up what I could in terms of an artist presence. Things have moved slower than I had hoped but patience truly is a virtue and I am proud (no matter how diminutive) of my accomplishments thus far. Well, long story short, funding for our project was eliminated and thus come December 29th, 2014, I will be jobless unless of course I do something about it. This is not good timing..... Or is it? I wish I could say I will then become a full time artist and live out my dream even if I do have to live off of top ramen for a while.... but bills need to be paid, and I am far too paranoid to live so frivolously. So for the past couple of months, while on the hunt for a new position, I have found myself pondering two things; first, where do I belong in the job world and second, what type of job could support me while also helping to advance my art career in some way? Naturally, there are several factors that come into play such as current job experience, degree, qualifications and so on. The only thing I know for sure, really, is that this can be a positive opportunity. This can be the turning point from aspiring artist to just plain old artist. This will hopefully start with blogging more, painting more, becoming more involved in my community's art scene.... all around just more! So I start this journey of more art with this blog post and close this post with a picture of some of most recent work, as well as a shameless plug for the RAW show happening this week! RAW shows are always tons of fun but I am extra excited to be a part of the July Showcase! I will have lots of new paintings, T-shirts, Hoodies and necklaces! 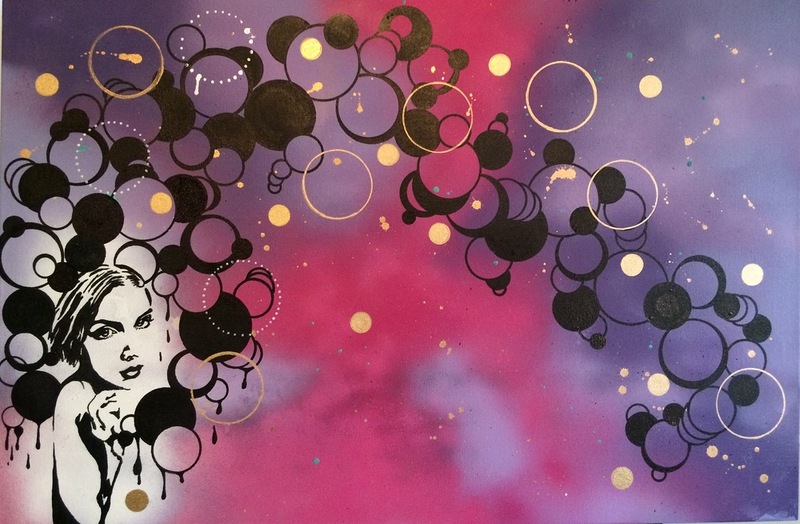 Happy to announce that I will be the featured April Artist for Camber Restaurant and Bar in Oakland! Visit their site to check out the awesome menu! Really excited to have some of my work up in Lower Branch's Monsters & Models group show this Friday!! I love the feelin behind this piece. The beauty in the color scheme and the slightly morbid elements painted in such a light hearted way.